Ahead of Donald Trump’s scheduled press conference in New York City on Wednesday, the public continues to give the president-elect low marks for how he is handling the transition process. Most disapprove of the job he has done outlining his plans for the country’s future and there remain widespread concerns about his potential conflicts of interest – though these concerns are somewhat lower than they were a month ago. In addition, Trump is at odds with the public over his tax returns: A wide majority says he has a responsibility to release his tax returns, a step he has yet to take. The latest national survey by Pew Research Center, conducted Jan. 4-9 among 1,502 adults, finds that 39% approve of the job President-elect Trump has done so far explaining his policies and plans for the future to the American people, while a larger share (55%) say they disapprove. Overall ratings have changed little since December and remain highly partisan: 72% of Republicans and Republican leaners approve of the job he is doing, compared with just 13% of Democrats and Democratic leaners. With Trump likely to face questions on how he plans to separate himself from his business interests as president, 57% of the public says they are either very (33%) or somewhat (24%) concerned that his relationships with organizations, businesses or foreign governments conflict with his ability to serve the country’s best interests. However, public concern is lower than it was in the immediate aftermath of the election: In December, 65% said they were at least somewhat concerned about Trump’s ability to serve the country’s best interests. The share saying they are very concerned about Trump’s potential conflicts of interest is down 12 points, from 45% a month ago. 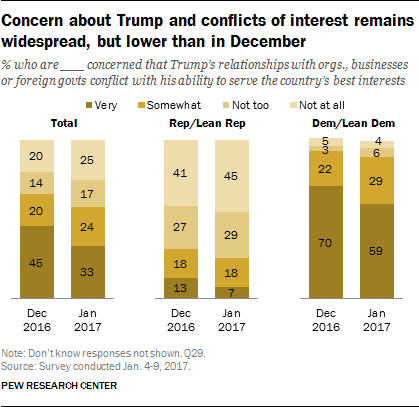 A majority of Democrats (59%) are very concerned that Trump’s relationships conflict with his ability to serve the country’s best interests; just 7% of Republicans say the same. Both groups express less concern than they did in December: Democrats are 11 points less likely to say they are very concerned and Republicans are 6 points less likely to say this. While Trump has yet to release his personal tax returns, the public thinks that he has a responsibility to do so: 60% say this, compared with 33% who say he does not have a responsibility to release his tax returns. 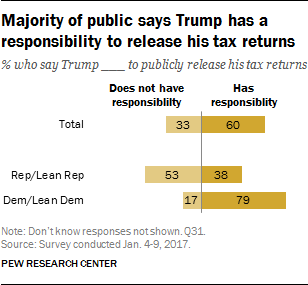 By 79% to 17%, more Democrats and Democratic leaners say Trump has a responsibility to release his tax returns than say he does not. Among Republicans and Republican leaners, 38% say he has a responsibility to do this, compared with 53% who say he does not have this responsibility. In the current survey, Republicans express confidence in Trump’s decision-making. Overall, 65% say they think Trump’s approach to making important decisions will be about right; roughly a quarter (28%) say he’ll be too impulsive. Conservative Republicans (74%) are more likely than moderate and liberal Republicans (51%) to say they think Trump’s decision-making will be about right. By contrast, Democrats overwhelmingly say that Trump will be too impulsive in making important decisions: 84% say this, compared with just 9% who think his approach will be about right. A wide majority of liberal Democrats (94%) say Trump will be too impulsive; a somewhat smaller majority of conservative and moderate Democrats say the same (77%). As confirmation hearings for Trump’s cabinet nominees begin, 41% say they approve of his cabinet choices and other high-level appointees, while 49% say that they disapprove. Views on this question are little changed from December. 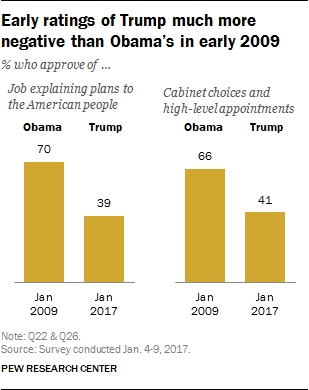 Trump receives much lower marks for both the job he has done explaining his plans and policies (39% approve) and for his cabinet choices (41% approve) than Obama received in 2009. Eight years ago, 70% approved of the job Obama had done explaining his plans and policies for the future and 66% said they approved of his cabinet selections. As reported in December, early ratings for Trump also trail those given to other recent presidents at similar points in their presidential transitions, including George W. Bush, Bill Clinton and George H.W. Bush. 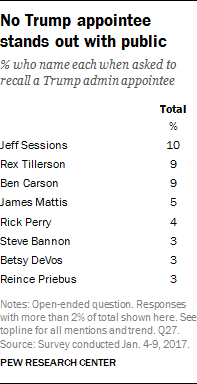 Trump’s cabinet choices and other high level appointments are not well known to the public: In an open-ended question, just 34% can recall the name of any individual Trump has selected to serve in his administration. In January 2009, 65% could recall the name of a person Obama had selected for a role in his administration (a level of awareness that was driven in large party by familiarity with his pick for Secretary of State, Hillary Clinton). In January 2001, fewer than half (43%) could name an appointee of George W. Bush; and in January 1993, just 21% could identify a person Bill Clinton had nominated for his cabinet or other high-level post. Today, 10% volunteer the name of Jeff Sessions, Trump’s choice for attorney general, when asked to name an administration appointee. About as many can recall the name of Trump’s nominee for Secretary of State (Rex Tillerson, 9%) or his nominee for Secretary of Housing and Urban Development (Ben Carson, 9%). Fewer can recall the names of other Trump appointees. For example, just 3% volunteer the name Steve Bannon, the former Breitbart News executive whom Trump named as his senior counselor and chief strategist. Who will be in charge in the Trump administration? The public is divided over how active a role they see Trump playing in his administration: 50% say Trump will be in charge of what goes on in his administration most of the time, while 43% say other people will be really running the government. In January 2001, following the election of George W. Bush, a CBS/New York Times survey found that 38% thought Bush would be in charge of what goes on in his administration most of the time, compared with 53% who said other people would be really running the government. Views of Trump’s role vary greatly by partisan affiliation, as well as age. Three-quarters of Republicans and Republican leaners say Trump will be in charge of his administration, including 83% of conservative Republicans and a somewhat smaller 61%-majority of moderate and liberal Republicans. By contrast, 62% of Democrats and Democratic leaners think other people will really be running the government. Among Democrats, there are no differences in views on this question by ideology. Young adults under age 30 do not think Trump will be in charge most of the time: 64% say other people will really be running the government. 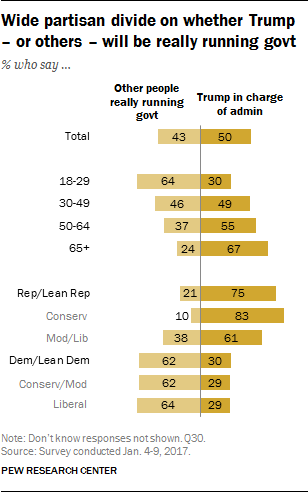 By contrast, 67% of those ages 65 and older say that Trump will be in charge of what goes on in his administration most of the time. 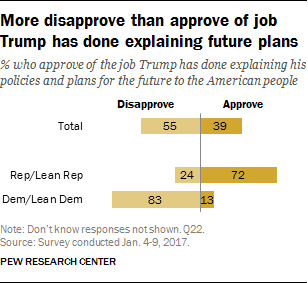 There are wide demographic differences in views of the job Trump has done so far explaining his plans and policies for the future. By 62% t0 33%, more women disapprove than approve of the job Trump has done. Among men, about as many say they approve of how Trump has outlined his plans (46%) as disapprove (48%). By more than two-to-one, blacks (69%-25%) and Hispanics (68%-27%) say they disapprove of the job Trump has done explaining his plans and policies to the American people. Whites are more evenly divided: 46% say they approve, while 49% disapprove. Clear majorities of those under age 50 say they disapprove of the job Trump has done so far laying out his vision for the country. By contrast, those age 50 and older are about as likely to say they approve of the job Trump has done so far than disapprove. Across levels of educational attainment, majorities of those with at least some college experience say they disapprove of the job Trump has done so far. Disapproval is especially high among those with a postgraduate degree (72%). By contrast, those with no more than a high school diploma are more positive in their views: 46% say they approve of the job Trump has done to this point, while 47% say they disapprove.